My mother—Yolande Gordon—lost all of her words to dementia. 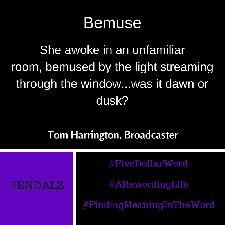 I want to disentangle words that addle my mind (and others) to help end this pernicious, inexorable disease. Words like dementia, bemuse, fulsome, etc. In doing so, I'm hoping to find meaning in the word—and the world at large. Finally, I'm also hoping it will help put the end in #demENDtia! NB: Half of the profits of each book will go toWORDS The Alzheimer's Society. One of the greatest sorrows in life is to see your mind slowly getting worst and worst over time. There is no magic cure presently for Alzheimer's. I have seen a good Uncle past away from Alzheimer's from injuries he received during WWII. With an aging population, more energy must be put into the treatment and research and development to combat Alzheimer's. This is a great idea using words. Great initiative Sheryl. I took my selfie showing my word "Assuage" which I either mispronounce, misspell, or misuse...and posted it on my facebook.....will challenge others. I'm happy to be part of this challenge. Although my mother didn't have ALZ, she was under the umbrella of dementia for the last twelve years of her life. She had no short term memory, so had to be in a care facility, and the patients there showed me the devastation of ALZ, as well as the beauty still left in their eyes. What a 'word'erful initiative on your behalf, Sheryl. I wish you great success in both your book and in your tribute fund in honour of your mother Yolande.